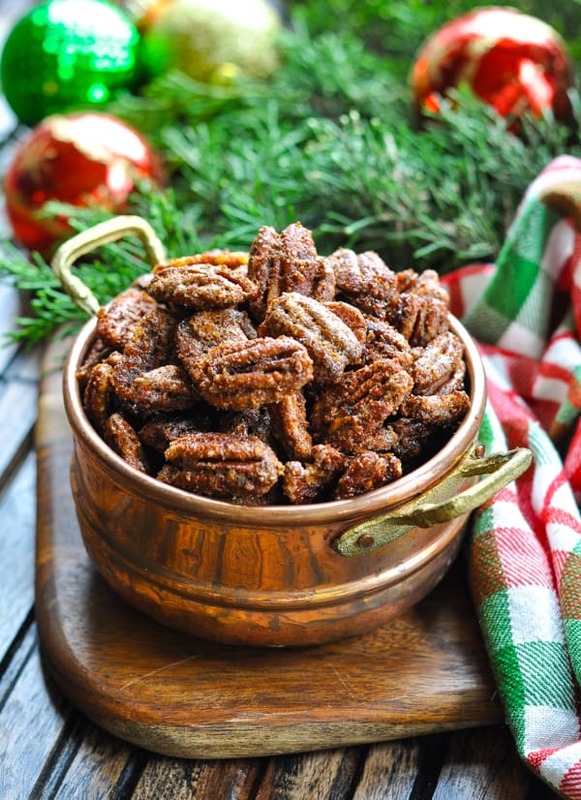 Mom's Easy Candied Pecans are a perfect hostess gift, holiday party appetizer, or salad topping for the season -- with just 5 minutes of prep! 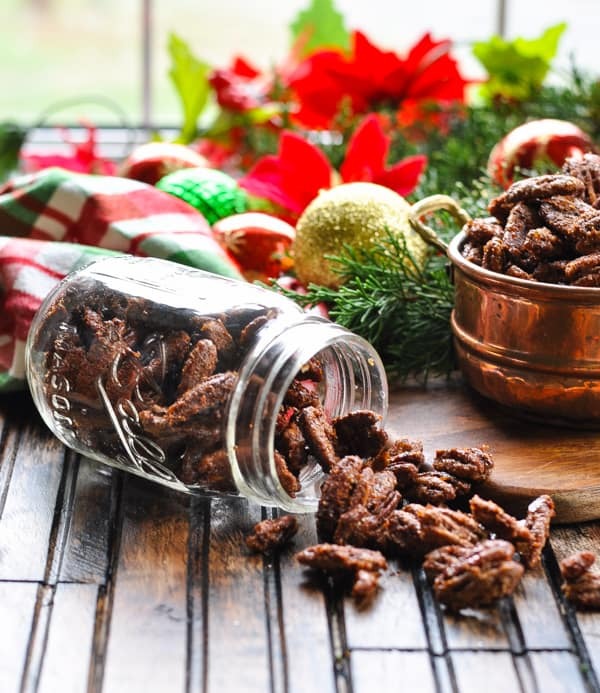 Mom’s Easy Candied Pecans are a perfect hostess gift, holiday party appetizer, or salad topping for the season — with just 5 minutes of prep! Add them to your next cheeseboard, wrap them up for your child’s school teacher, or just grab a handful on the run. You’ve never tasted such delicious spiced nuts! 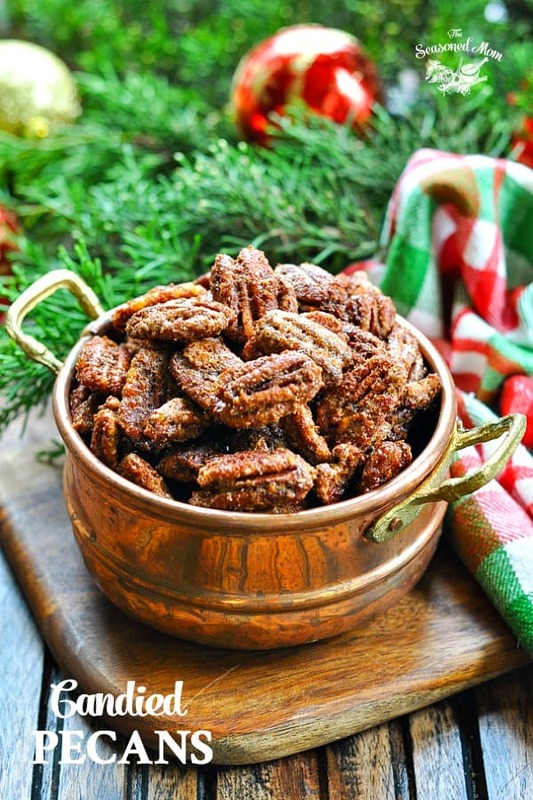 My mom has been making these cinnamon sugar pecans during the holidays for as long as I can remember! She shares them with neighbors, she gifts them to me (because she knows that I love them), and she keeps a stash in her pantry to add to her own salads or cheese trays throughout the season. They are a family tradition, and I can’t wait for you to see why! Not familiar with these spiced nuts? 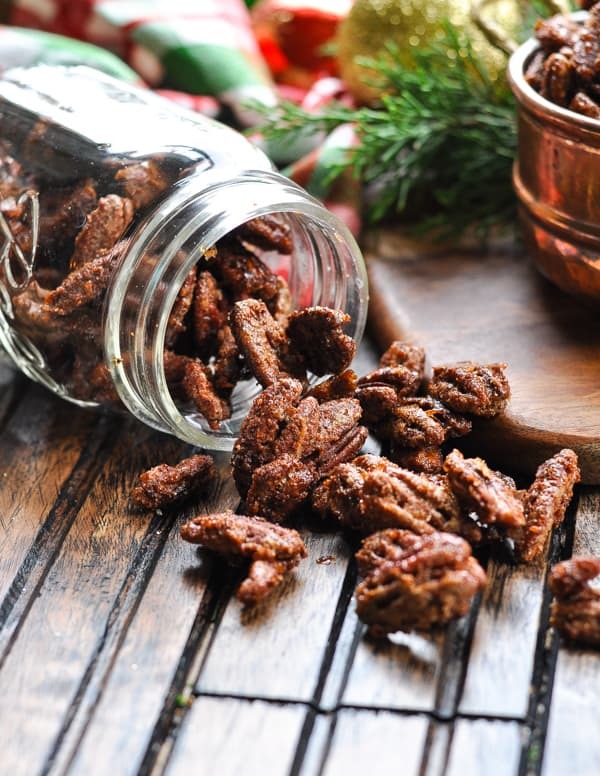 Candied Pecans are crispy, crunchy glazed pecans that include sugar, salt and warm seasonings like cinnamon and nutmeg. The nuts are tossed in an egg white before getting baked in the oven, which gives them an amazing, thick coating that you can’t duplicate in any other way. 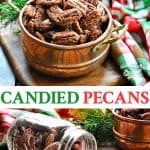 Are Candied Pecans gluten free? Yes, these Candied Pecans are gluten-free, so you can safely share them with all of your wheat-intolerant friends! First, whisk together an egg white and water. Toss the egg white mixture with pecans to coat. In a small bowl, combine sugar, cinnamon, salt, cloves and nutmeg. Sprinkle the sugar mixture over the pecans and stir. Then just spread the nuts on a baking sheet and pop them in a 350-degree F oven for about 25 minutes. Remember to stir the nuts every 10 minutes or so. This will help them toast evenly (and not burn)! Allow the Candied Pecans to cool for at least 30 minutes. They will continue to crisp up and harden as they cool. Once they are no longer warm, store the nuts in an airtight container at room temperature for at least 2-3 weeks. If you want them to last even longer, you can keep them in the refrigerator. Remember — do not package your warm nuts! They need to be completely cool before storing them. Can you freeze Candied Pecans? Yes! If you want these Candied Pecans to last for months, store them in an airtight container in the freezer. They will keep for at least 3 months. 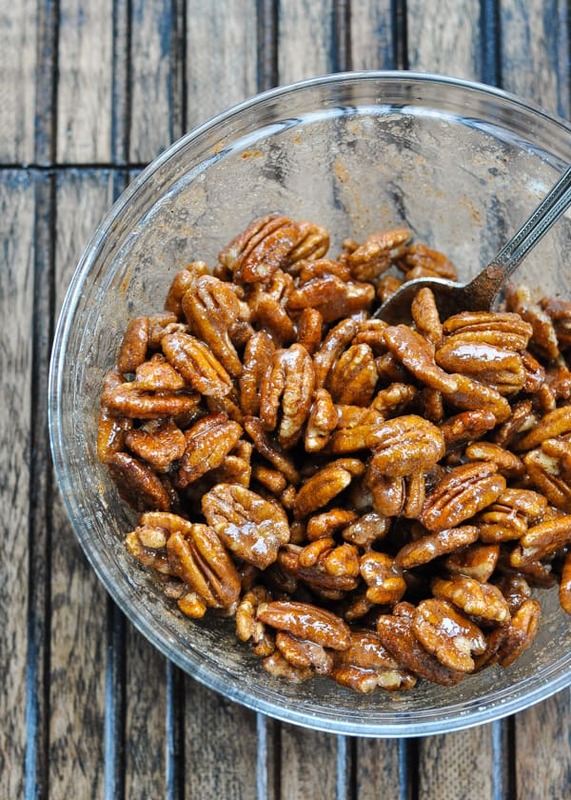 Candied Pecans for Salad: one of the most popular ways to enjoy Candied Pecans! The sweet, salty, and crunchy nuts make the perfect addition to your next salad. Try them on top of my Fall Harvest Salad with Pumpkin Goddess Dressing, or on top of my Autumn’s Best Tossed Salad with Apple Butter Vinaigrette! 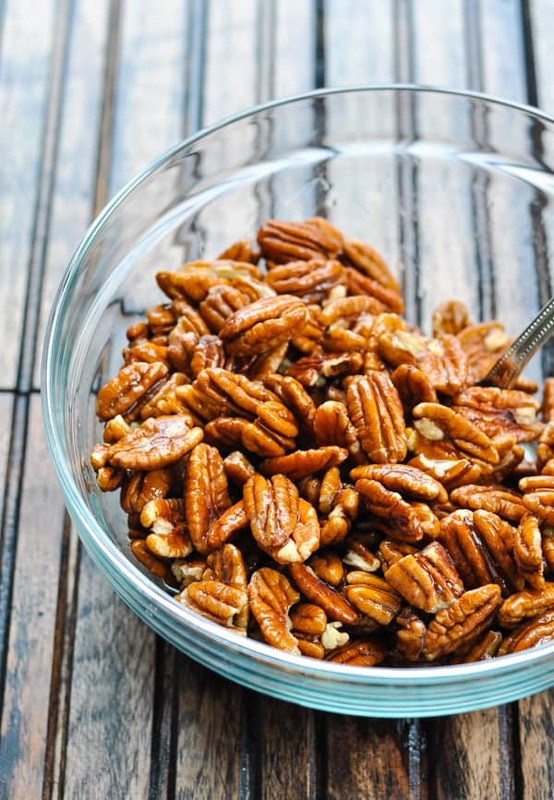 Candied Pecans on Oatmeal or Yogurt: the nuts give these smooth and creamy breakfast options a nice added crunch! Try them on top of my Eggnog Overnight Oats, on top of a bowl of Pumpkin Spice Slow Cooker Oatmeal, garnishing a Frosted Sugar Cookie Protein Shake, stirred into some vanilla Greek yogurt with an extra dash of cinnamon, or atop a slice of warm Cranberry Baked Oatmeal. Candied Pecans on a Cheese Tray: arrange a bowl (or two) of candied pecans on your next cheeseboard. They’re a delicious, satisfying complement to cheese, crackers, grapes, and wine! 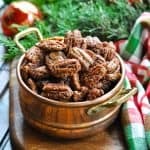 Make a few batches of these perfectly spiced nuts and share them with loved ones this season (or hoard them all for yourself…that’s okay and totally understandable)! Preheat oven to 350 degrees F. Line a rimmed baking sheet with parchment or a silicone mat. 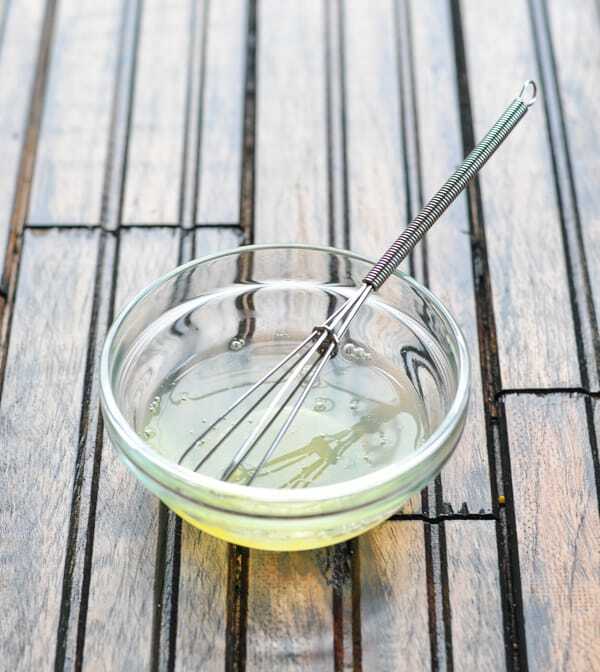 Whisk together egg white and water. Add pecans and stir until completely coated. 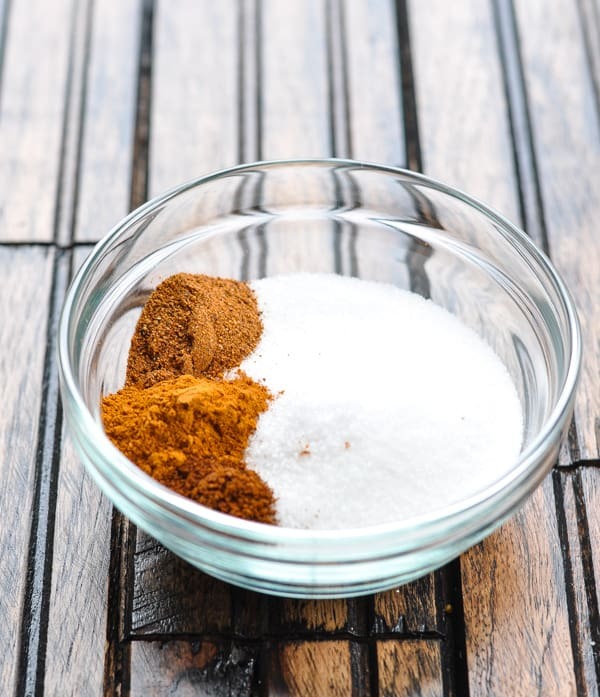 Mix together sugar, salt, cinnamon, nutmeg and cloves in a bowl. Sprinkle over the nuts and stir to combine. Spread nuts on the prepared baking sheet. Bake for 23-27 minutes, stirring every 10 minutes, or until nuts are toasted (but not burned). Keep your eye on them during the final 5 minutes, because mine were ready to come out of the oven after just 24 minutes. The nuts will continue to crisp and harden as they cool. When the nuts are entirely cooled, store in airtight container. You’re so kind, Bethany! Thank you!! Yay! Aren’t they the best? I’m so glad that you loved them as much as we do!